[W]hen people thought the earth was flat, they were wrong. When people thought the earth was spherical, they were wrong. But if you think that thinking the earth is spherical is just as wrong as thinking the earth is flat, then your view is wronger than both of them put together. Isaac Asimov, born January 2, 1920. He wrote hundreds of books, both fiction and non-fiction, popularizing science while sporting sideburns to make Victorians jealous. 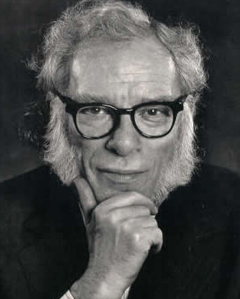 Isaac Asimov was born this day in 1920. He’s probably best known as a science fiction writer, for good reason: he wrote the classic stories Nightfall, the Foundation trilogy, and the highly influential anthology I, Robot, which dealt in part with the ethics of intelligent android robots. He was a biochemist in his “day job”, and wrote a lot of popular science books on a wide variety of topics, including Quasars, Pulsars, and Black Holes, which had a profound effect on me when I read it in 6th grade. He was one of the most prolific writers in history, publishing a phenomenal amount of work in fiction and non-fiction alike. Among his works: mystery stories, bawdy limericks, environmentalism, and many other topics. Asimov died in 1992, before the World Wide Web really took off, so it’s hard to know exactly what he would think of the modern internet. However, given how prolific, tech-savvy, and forward-looking he was, I like to think he would enjoy the spirit of the science blogosphere, even if he didn’t blog himself.